I am not sure why I don’t make tostadas more at home? Think about it. You have a crispy corn tortilla that carries frijoles, juicy meat, and host of fresh and delicious ingredients. And, if you’re thinking about your waistline and incorporating more greens and vegetables into all of your dishes like me, the tostada turns out to be perfect way to portion out your food. What makes this tostada recipe a lighter version? The chicken has been roasted and skin and fat removed. The pinto beans have no lard or cheese. They were simply cooked with onion and garlic and mashed. 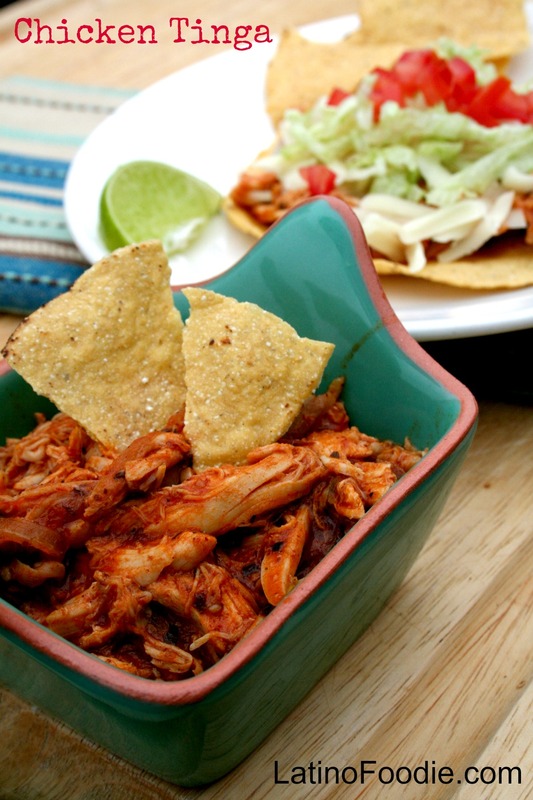 Yet, it is the “tinga” sauce from the Herdez Chipotle Cooking Sauce that adds heat and a smokey flavor. The amount of chicken is about 1/4 cup on each tostada, meaning less than 160 calories of protein. Of course, I love to pile on the lettuce and other veggies to make me feel completely satisfied. Garnish with Diced tomatoes and Avocados. 1. In a large frying pan heat the oil over medium heat. Sauté the onions until slightly translucent, about 2-3minutes. Add the garlic and sauté for 1 more minute, stirring frequently to prevent burning. Add the oregano, marjoram, thyme, black pepper. Stir for another minute. 2. Add the Herdez Chipotle Cooking Sauce and chicken broth. Bring to boil over high heat, then reduce to a simmer. 3. Mix in the chicken and allow to simmer for another 20 minutes. 4. Meanwhile, prepare the lettuce, jack cheese, tomatoes, and avocados. 5. On individual plates, place the tostadas. Spread a first layer with mashed pinto beans. Add about a ½ cup of the chicken tinga mixture. Top with the lettuce, cheese, tomatoes and avocados. Serve hot. This is a sponsored post with Herdez brands. However, all opinions are our own. Thank you for supporting the brands that sponsor our blog to help us keep bringing delicious dishes to you!